The length and width of maturing Brassica pods increase towards maturity, coinciding with seed swelling as they accumulate mass and storage compounds and as the moisture content falls. Fig. 3.5. Illustration of changes in free sugars and oil content of cauliflower (Brassica oleracea var. botrytis) seeds during development and maturation (Gurusamy and Thiagarajan). Fig. 3.6. Illustration of changes in free amino acids and protein in cauliflower (Brassica oleracea var. botrytis) seeds during development and maturation (Gurusamy and Thiagarajan). Fig. 3.7. Illustration of changes in moisture content and germinability of cauliflower (Brassica oleracea var. botrytis) seeds during development (Gurusamy and Thiagarajan). 3.7. Illustration of changes in moisture content and germinability of cauliflower (Brassica oleracea var. botrytis) seeds during development (Gurusamy and Thiagarajan). and again is influenced by the environment in which the seed-producing parent plant is growing (Sreeramulu et al., 1992). 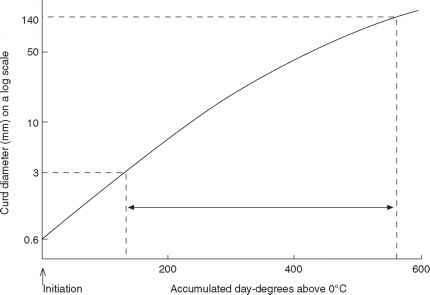 The capacity for germination is initiated by week 3 after anthesis and increases steadily thereafter (Fig. 3.7). The precise timing of these phases depends on the particular Brassica species, its cultivars and the environments in which the seed crops are grown. Studies of broccoli cv. Waltham-29, an open pollinated form, showed that it matures more rapidly than cauliflower. Maximum seed weight was reached 42 days after pollination. Abscission of the seed from the placenta (funiculus) started 42-49 days after pollination and coincided with a sharp decline in fresh weight. Chlorophyll content of both seed testa and siliquae declines from 42 days after pollination, and they acquire a tan and reddish-brown coloration, respectively, by 56 days. This is a common phenomenon with dry fruits, such as pods, where desiccation coincides with maximum dry weight accumulation. In mustard, for instance, there is a complete loss of chlorophyll from the seed coat (testa) by 42 days after pollination, while in broccoli the majority of pods (siliquae) have shed (dehisced) their seed by 84 days after pollination (Jett and Welbaum, 1996). Typical changes in the appearance of seed pods during development are shown in Table 3.1, using red cabbage (B. oleracea var. capitata) as an example. Table 3.1. Moisture content, siliquae and seed characteristics of red cabbage (Brassica oleracea var. capitata) during seed development. After Still and Bradford (1998). Fig. 3.8. Illustration of changes in the speed of germination, seedling dry weight and seedling length of cauliflower (Brassica oleracea var. botrytis) during development (Gurusamy and Thiagarajan). may behave in a precocious manner. 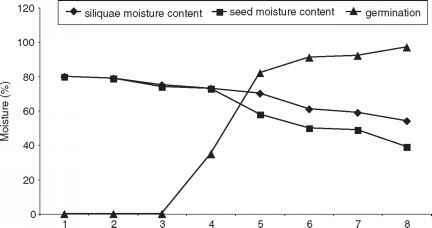 The speed of germination increases as seeds approach maturity (Fig. 3.8). The maximum germination rate for cabbage (B. oleracea var. capitata) was reported at 48 days after pollination (Still and Bradford, 1994). Mature seeds require sufficient nutrients and other stored reserves to support germination and post-germination activity until the seedling is capable of independent growth. Generally, the speed at which seedlings grow and increase in dry weight correlates with the maturity of the parent seed (see also Ellis et al., 1987). Harrington (1972) suggested that physiological maturity of seeds is defined as the developmental stage at which they achieve maximum viability and vigour. 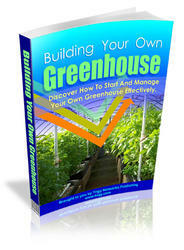 At this point, nutrients cease entering the seed from the parent plant and ageing begins. Physiological maturity is the most appropriate time to harvest seed (Ellis et al., 1987). In cauliflower, the period between 49 and 56 days after anthesis is the point of physiological and harvest maturity. After this point, there are reductions to seed and siliquae mass and dimensions, with deterioration commencing due to oxidation, volatization, desiccation and loss of nutrients. In comparison, mustard (Sinapis alba L.) reached physiological maturity 60 days after pollination (Fischer et al., 1988). Immature mustard seed harvested without drying germinated as early as 14 days after pollination, although desiccation tolerance was not attained until 35 days after pollination (Ahuja et al., 1981).